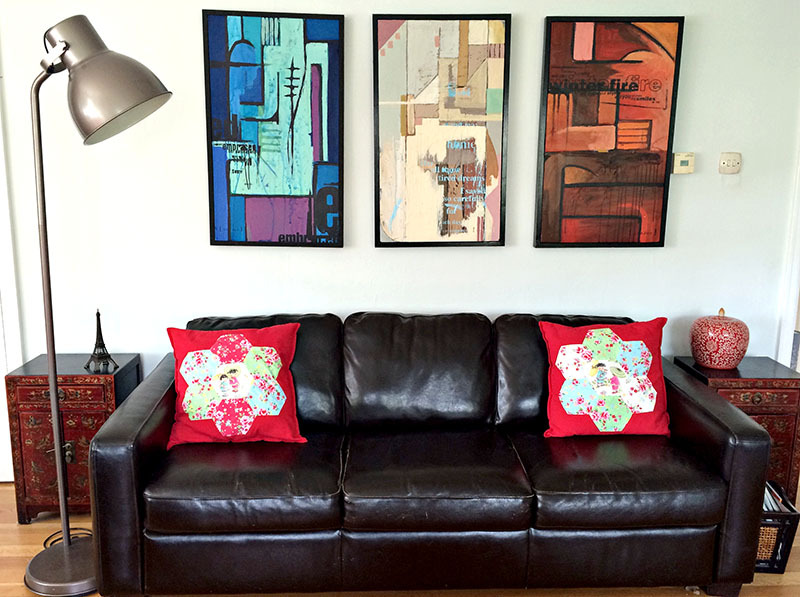 These gorgeous cushions were made by my sister Tasha. 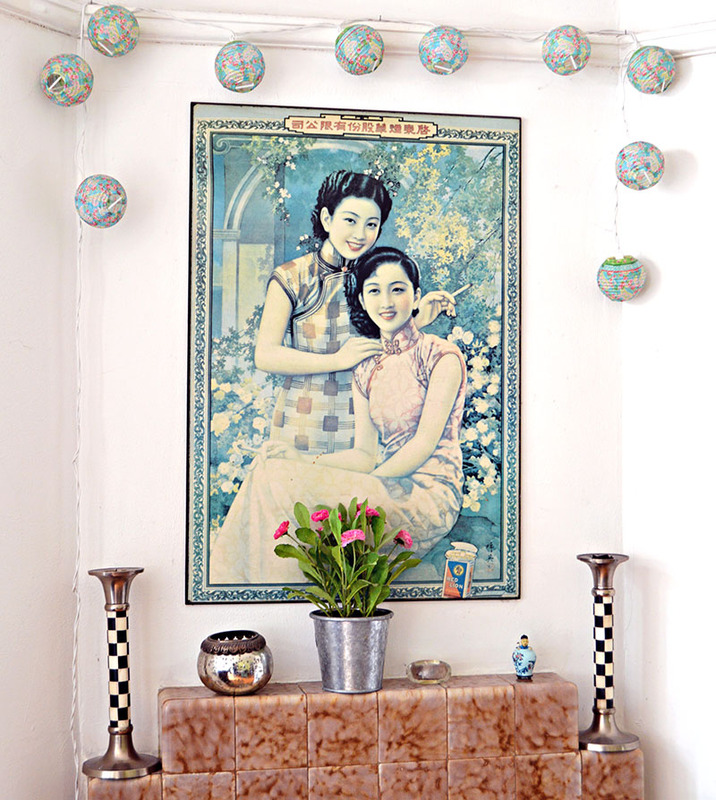 She used a fabric called China Doll by Michael Miller to give it a retro Chinese feel, which really fits in with the decor of her house. This is a really easy hand sewn craft suitable for all levels. 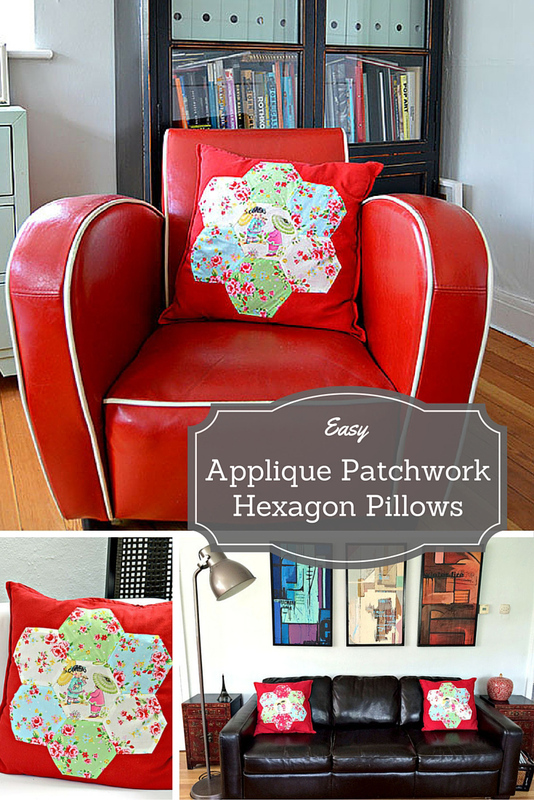 It is so easy to make your own hexagon patchwork cushion. 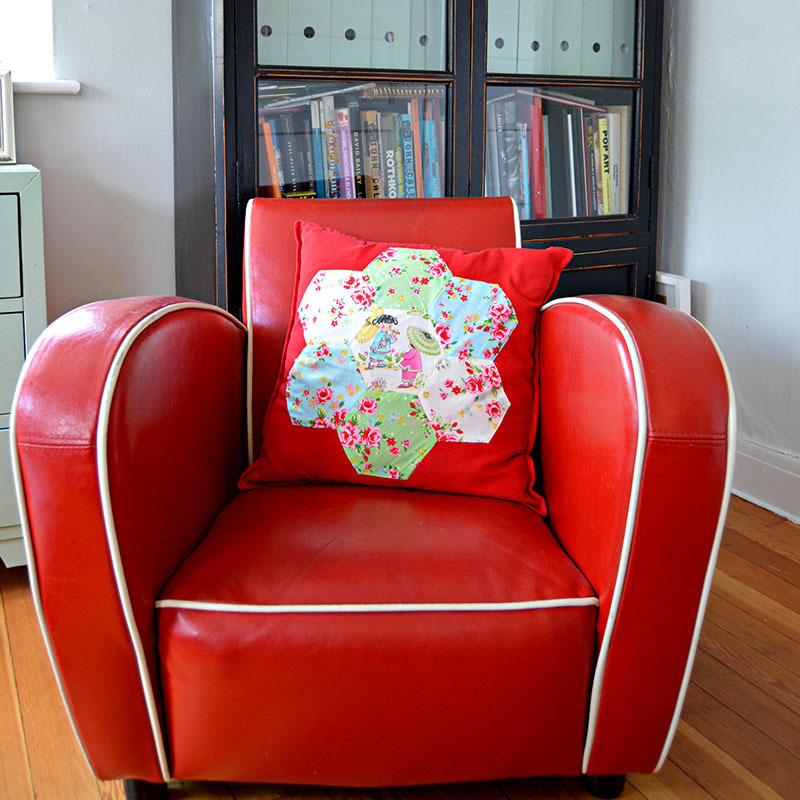 Appliqueing hexagons to an existing cushion cover makes it a quicker craft than patchworking a whole cushion. 3 to 4 different colour fabrics. 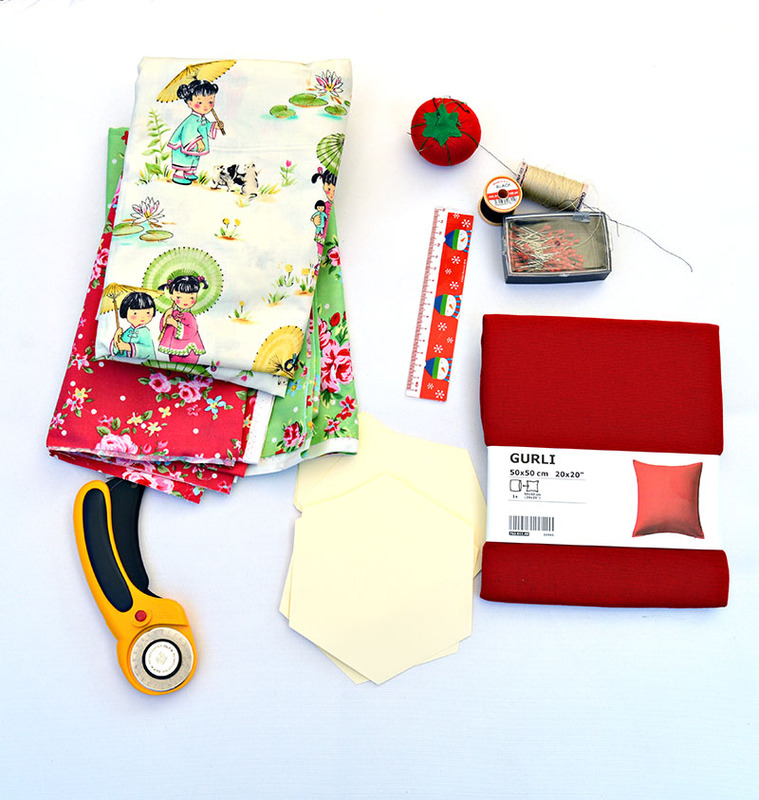 The fabric used here was China Doll by Michael Miller which can be purchase online. A fat quarter of each colour way should give you enough fabric for several cushions. 3 inch Paper hexagon squares. These can be bought cheaply on-line or you can cut your own. IKEA Gurli 50cm X 50cm cushion cover. Any plain cushion cover will do. Iron fabric to make sure its straight before you start. Stick the double side tape to the middle of a paper hexagon. Then stick the hexagon to the reverse side of your fabric where you want the pattern. Using a ruler to get a 1cm edge around the hexagon, cut the fabric with a rotary cutter. 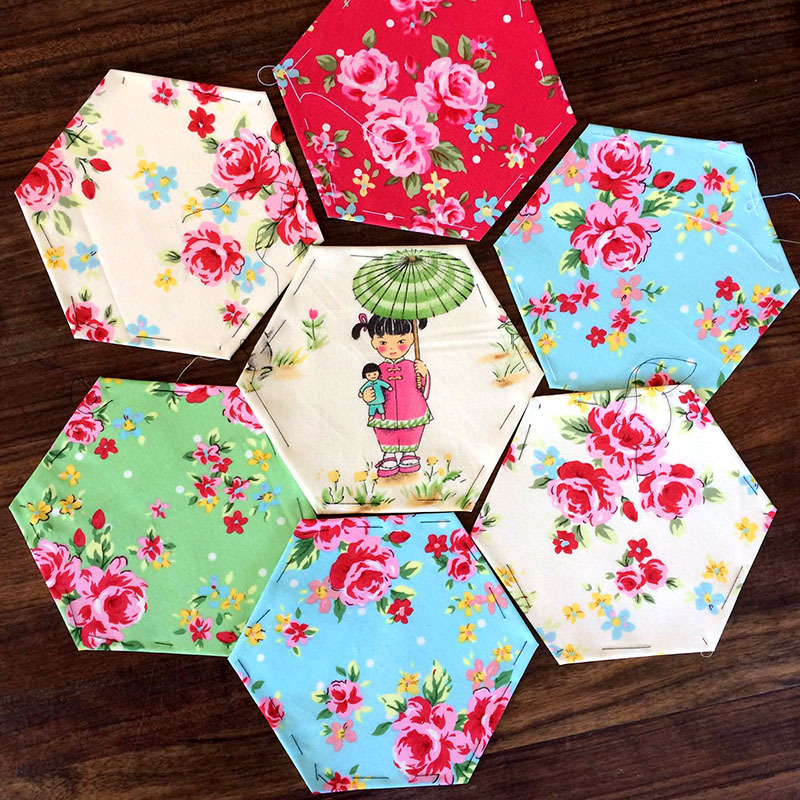 Repeat with your chosen fabric pieces you will need 7 hexagons for each cushion. 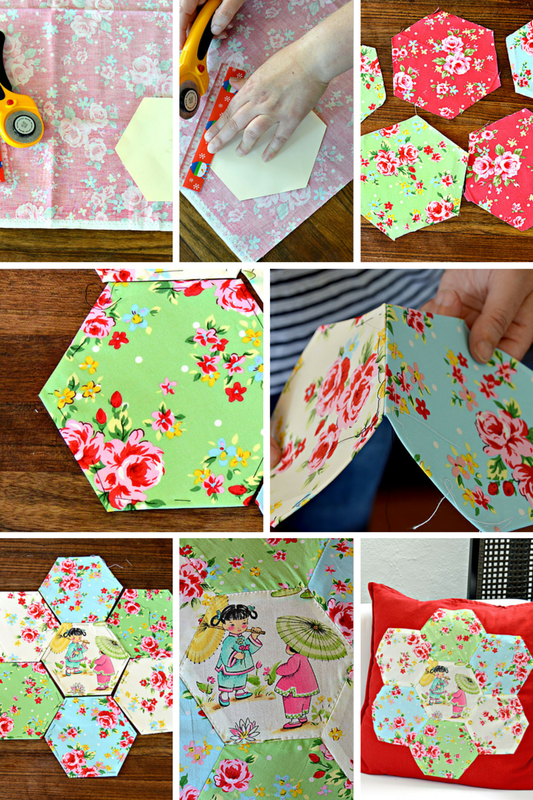 Now you need to tack your fabric to the paper hexagons. To do this first make sure your paper hexagon is centered and then secure to fabric with a pin. Fold your fabric edge over the paper hexagon and using a contrasting thread tack the folded fabric edge to the paper hexagon. Continue round the whole hexagon folding the fabric over the paper as you go round. When finished don’t knot the end of your thread as you will be pulling this out later. Decided on how you want your 7 hexagons to fit together, one on the inside and 6 round the edge. Using your arranged design as your guide whip stitch the hexagons together. You will be stitching at the very edges of the hexagons, just going through the fabric and not the paper hexagons. You should now have a neatly sewn fabric panel consisting of seven hexagons. Carefully pin this to the cushion cover. Start the applique with the middle fabric hexagon. 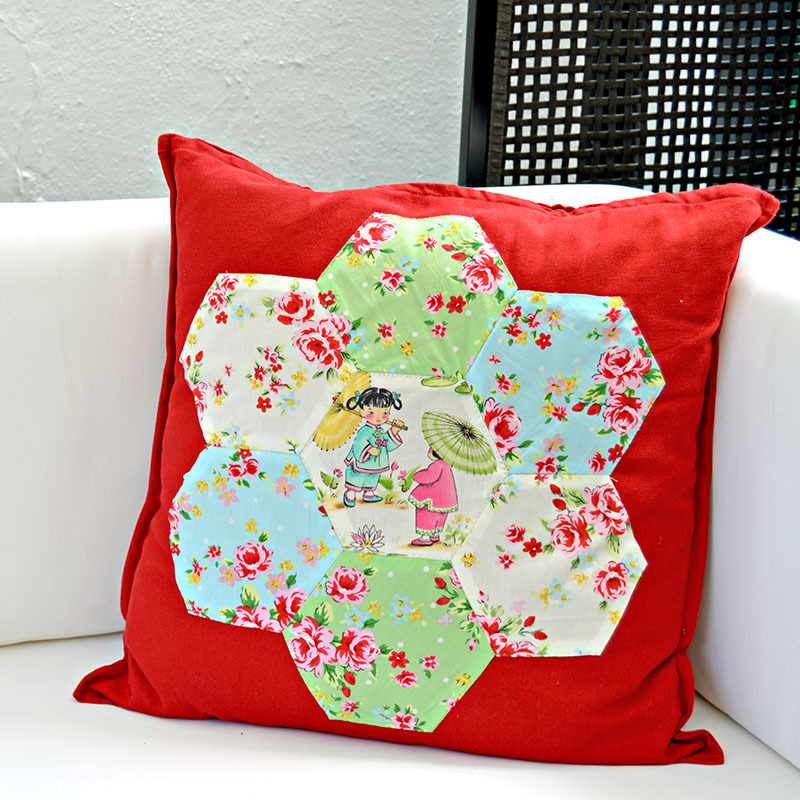 Using a thread that matches your fabric and a small running stitch neatly sew the hexagon to the cushion cover. Your stitches should go all around the very the edge of the hexagon. You will need to eventually remove the paper hexagons. However, it is easier if you can keep the paper hexagons in the patchwork panel as long as possible. As the panel keeps its shape better and is easier to work with. That means on the outer hexagon the paper stays in until you have appliqued all but the last side. Repeat this time going round the outer edge of the whole hexagon panel. This should be enough the securely attach the hexagons to cushion cover so no need to sew any more edges. The method used above is based on a technique called English Paper Piercing you can find more details on craftsy. This is a lovely project to do as you don’t need to get your sewing machine out, it can be done slowly overtime in the evenings while watching TV. The final cushion looks great I love the retro feel of the fabric and the patchwork effect. I love making hexies so much that I used this paper hexagon method to make a denim patchowrk chair with old jeans for a really fabulous upcycle. Great way to brighten up some plain cushions. Love the fabrics your sister has chosen. Yes a nice way to end up with some unique cushions. Thank you look forward to seeing it. What a great job your sister did on those cute pillows! 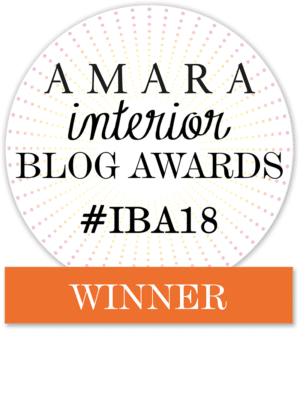 Thanks for sharing on the Weekend Blog Hop (www.myflagstaffhome.com). These are too cute! I love the colors that she used and the simplicity of the project. Thank you, the colours do look great together. Oh! I simply love this project. I adore the way you framed the image with the other fabrics and I love your color scheme. I have to make something like this! Thank you, it really does fit in with the decor and is an easy sewing project. Just love this! And fun to see what your sister has been up to as well. Haven’t done any paper piecing or quilts for that matter, but of course have lots of fabric lined up for that purpose, hope it happens soon! thanks for sharing on craft schooling sunday! Thanks it is one of those crafts that you can do a bit of at a time, but like everything else its just a case of starting. Super cute pillows! I really like those fabrics! I’d love for you to stop by the Submarine Sunday Link Party to share this crafty creation! I hope to see you there! Cheers and thank you for the invite. Thank you and cheers for the invite. I really love your sisters style! Thanks, I really like your sisters style as well !